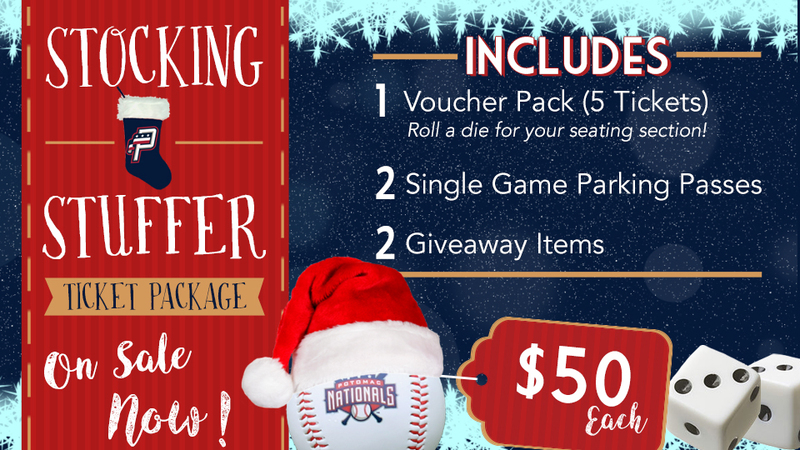 P-Nats Annual Stocking Stuffer Packages Now on Sale! Woodbridge, VA---With the holiday season upon us, the Potomac Nationals are excited to announce that Stocking Stuffer ticket packages are now on sale! Buy the perfect holiday gift that includes extra perks! These packages will be available for sale through December 31st. The deadline to pick up the Stocking Stuffer package at Northwest Federal Field before the office closes for the holidays is December 21st at noon, and that is also the same date to be able to purchase the package with the option to mail the ticket package out before the holidays. What seating section your voucher pack will be for is up to chance! Fans will roll a die when they pick up their package to determine what section they get! Roll a one or a two and sit in the Reserved Section. Roll a three or a four and get Box seats. Roll a five or a six and end up in the Field Box! Fans who chose to have their packages mailed will receive a random section.